Typing is hard. I hardly ever type unless I have to. In fact, roughly 80% of MobileCrunch’s operating bills go towards paying a full staff of invisible underlings to write what I say and censor my vulgarity. Unfortunately for the livelihood of the aforementioned underlings, they’re now replaceable by a BlackBerry. 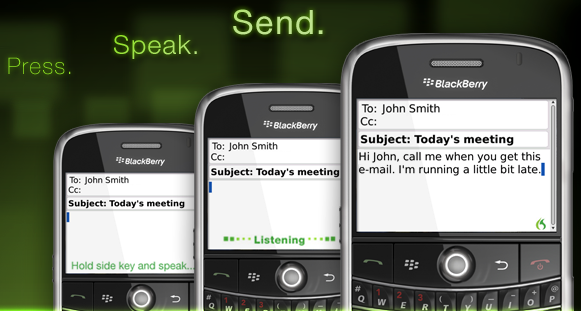 Following up on the launch of Dragon Dictation apps for the iPhone, Nuance has just launched their first venture into the world of BlackBerry. Unlike the iPhone releases (a Search app, and a sort of generic notepad meant for copying-and-pasting transcribed text to other apps), the focus here is e-mail. The image up top wraps it up pretty well: press a button, talk a bit, and it’ll make a valiant effort to transcribe everything you’ve said. Processing generally takes about 5 seconds, with accuracy ranging from spot-on to “Oh god, how did it think I said that?” depending on your accent and rate of speech. The Dragon Dictation for E-Mail app is available now on BlAppWorld for free. They say the “free” part is only for a limited time — but they said the same thing about the iPhone release, and thats been out for months now and is still free. Regardless, probably better to grab it up quick.